A. A. Gill's memoir begins in the dark of a dormitory with six strangers. He is an alcoholic, dying in the last-chance saloon. He tells the truth - as far as he can remember it - about drinking and about what it is like to be drunk. He recalls the lost days, lost friends, failed marriages ... But there was also an 'optimum inebriation, a time when it was all golden'. Sobriety regained, there are painterly descriptions of people and places, unforgettable musings about childhood and family, art and religion; and most movingly, the connections between his cooking, dyslexia and his missing brother. 4.0 颗星，最多 5 颗星A truly intelligent memoir by a remarkable character. 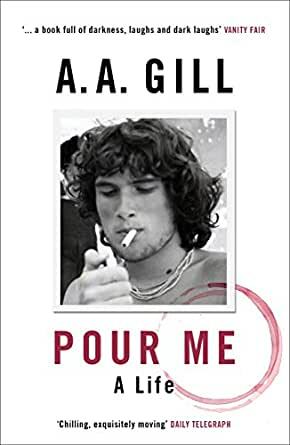 This erudite memoir by Adrian Gill came as a complete surprise to me -- not because I "know" him, but because I could never imagine that here was the real person behind the acerbic wit of his food reviews and in other pieces I've read. His dyslexia (which obviously impacted on his life in many ways) is hard to comprehend, because I have never, or seldom, come across such an erudite wordsmith. I confess that, with English as my second language, I came across sentences I simply did not understand fully! The memoir is touching in places, very funny in others, but I could have done without the instructive speeches on certain subjects: the man has many interests and when he's interested in something, he seems to learn all about it and tugs at it like a dog a bone. Before reading this book I had no idea of his battle against alcoholism and drugs, and I admire him for his painfully truthful account of that time in his life and then overcoming it. We hear a lot about his father, but his mother (who didn't want to be in the story) doesn't feature often -- a pity: I would have loved to know more about her. Adrian Gill is a creature cut from a different cloth than others -- a trait I always enjoy among a world of rather boring and ordinary people. Yet below the surface of his tale, told with amazing eloquence and intelligence, I sense a certain loneliness, reminiscent of the true anchorite. But with AA Gill you can never be sure of anything, and I might be wrong. No review - just an opinion. This guy could write -wow! 5.0 颗星，最多 5 颗星A Must Read!